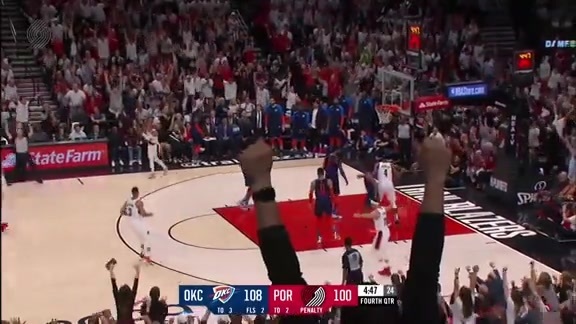 After ending a 10-game playoff losing streak with a 104-99 victory in Game 1 Sunday afternoon, the three-seed Portland Trail Blazers will try to protect home court yet again in Game Two versus the six-seed Oklahoma City Thunder Tuesday night at the Moda Center. Tipoff is scheduled for 7:30 p.m.
"We just won one game," said Damian Lillard. "It does feel good to get back on the winning side. We had two years of being swept, so obviously we feel good about that, but it's more about how we can sustain it, us focusing on the next thing. We can't get caught up in 'Ah, we won a game' and all that stuff cause series change quick. We can't forget that. I think that bad taste of, I guess, failure on the postseason doesn't go away with one win. It's humbled us more than anything in a way where we're going to come out with that business attitude and our focus is going to remain the same." Tipoff is scheduled for 7:30 p.m.
• Oklahoma City swept Portland 4-0, one season after Portland swept Oklahoma City 4-0. • The Thunder’s average margin of victory in the four wins was 7.0 points. • Damian Lillard posted his highest scoring average against a Western Conference opponent vs. the Thunder this season, averaging 34.8 points (46.2% FG, 25.0% 3-PT, 91.7% FT) to go with 4.3 rebounds, 7.8 assists and 2.50 steals in four games. 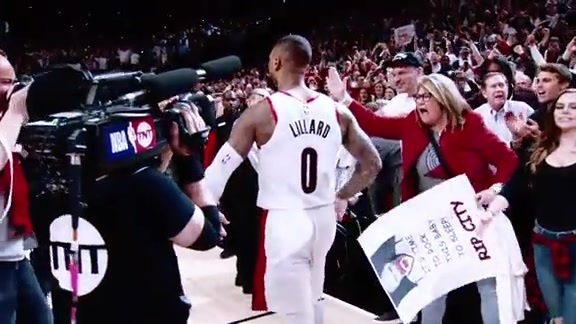 • Lillard scored a season-high 51 points vs. the Thunder on March 7. • Lillard posted career highs in free throws (18) and attempts (20) in the March 7 overtime loss to the Thunder. • CJ McCollum averaged 19.8 points, 3.5 rebounds and 3.0 assists in four games. • Paul George paced the Thunder vs. Portland this season, posting averages of 38.0 points (45.2% FG, 45.9% 3-PT, 85.0 FT%), 10.5 rebounds, 5.5 assists and 2.75 steals. • Russell Westbrook averaged 29.5 points (43.2% FG, 35.0% 3-PT, 78.4% FT), 10.0 rebounds and 8.8 assists vs. Portland this season. • The series marks Portland’s first playoff matchup against a divisional opponent since facing the Lakers in 2002 as members of the Pacific Division. The Trail Blazers have never faced a Northwest Division opponent since the division was formed in 2004-05. 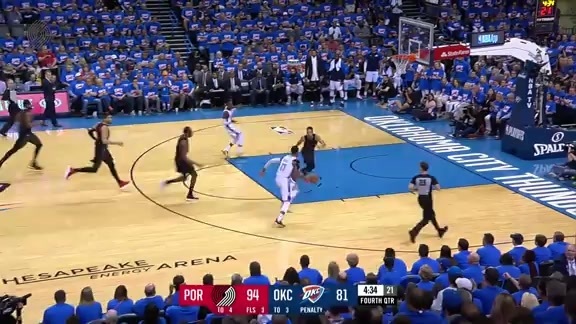 • This marks the first playoff series between the Trail Blazers and Thunder since the franchise moved from Seattle to Oklahoma City prior to the 2008-09 season. • The Trail Blazers have now faced every Western Conference franchise in their current city in the playoffs with the exception of Sacramento. • Portland played Seattle four times in the postseason, going 8-8 vs. the Sonics with each team winning two series. • The Sonics defeated the Trail Blazers 4-2 in the 1978 Western Conference Semifinals. • Seattle beat Portland 2-1 in a first-round matchup in 1980. • In 1983, Portland defeated Seattle 2-0 in the first round. • The Trail Blazers beat the Sonics 3-2 in the first round of the 1991 NBA Playoffs. • Portland center Enes Kanter played parts of three seasons for the Thunder from 2014-17, averaging 14.2 points and 8.0 rebounds in 180 games (27 starts). • Thunder guard Raymond Felton spent the 2011-12 season in Portland, where he averaged 11.4 points, 2.5 rebounds and 6.5 assists in 60 games (56 starts). • Trail Blazers head coach Terry Stotts was a four-year starter at the University of Oklahoma, where he earned All-Big Eight honors his senior year. Trail Blazers center Jusuf Nurkic (left leg) is out for Tuesday's Game #2 and the duration of the postseason. As for the Thunder, Andre Roberson (left patellar) and Hamidou Diallo (right elbow) are out. Game 2 will be broadcast locally on NBC Sports Northwest with Kevin Calabro, Lamar Hurd and Brooke Olzendam calling the action. The game will also air nationally on TNT. Brian Wheeler and Michael Holton will have the call on Rip City Radio 620 AM and on all of the stations of the Trail Blazers Radio Network.